Leading Tory Chris Grayling claims there's been a "98% INCREASE in serious violent crime" - the true figure, however, is a 50% FALL in violent crime since 1995. Chris Grayling’s attack on the British Crime Survey (BCS), which he described as “fundamentally flawed” on the Today programme this morning, is unravelling fast. Living up to his reputation as the weak link in the Tory line-up, he claimed there had been a “98 PER CENT INCREASE in serious violent crime” – the true figure, as the BBC’s Mark Easton reminded him, is a “50 PER CENT FALL in violent crime since 1995”. He also claimed the BCS “didn’t take account of crimes committed by people under the age of 16” – again, the Shadow Home Secretary is simply wrong. Not only were crimes committed by under-16s against adults already included in the survey, but from last January – January 2009 – the experiences of under-16s were included as well. Grayling also said a major flaw of the survey was that it didn’t include murder or manslaughter. Using the figures which do include those crimes, however, reveals a downward trend – a fact Grayling failed to mention, claiming that “since the start of the decade there have been steady year-by-year increases in violent crime”. 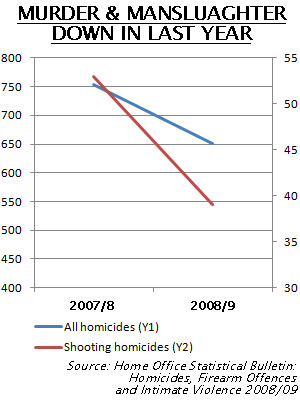 As Left Foot Forward reported last month, the “Home Office Statistical Bulletin: Homicides, Firearm Offences and Intimate Violence 2008/09” shows a 14 per cent fall in homicides year-on-year, from 753 to 651 – the lowest level for ten years – with shooting homicides down 26 per cent since 2007/8 from 53 to 39. • Listen to Grayling’s interview and read the transcript. Andrew Pakes, Labour PPC for Milton Keynes North, has told Left Foot Forward that the Tories’ false claims that there had been 6,000 violent attacks in Milton Keynes in 2008/09 – a 236 per cent increase, equivalent to a violent attack every 90 mins – were a “disgraceful attempt” to play politics with crime. “It is incredible to see just how far the Tories are prepared to go in manipulating the figures for their own partisan gain. No wonder the local police and BBC felt the need to speak out on this issue and make clear that the Tories were misleading the public. …and @shamikdas has also covered it for @leftfootfwd: http://bit.ly/bMj8vp Letting Osborne and Grayling speak on consecutive days, tsk. Erm, yes, and? Medical treatment for traumatic injuries has got better recently. So? Have you not seen all those reports about how the ratio of dead to injured in hte armed forces has changed radically over the past few years? Tim, I think it’s a good thing that the number of homicides is down 14 per cent, to its lowest level since 1998/99. Nice to see he continued where he left off.